Sold for over £600 in London auction - April 2002. We have another copy available. Please ask if interested. 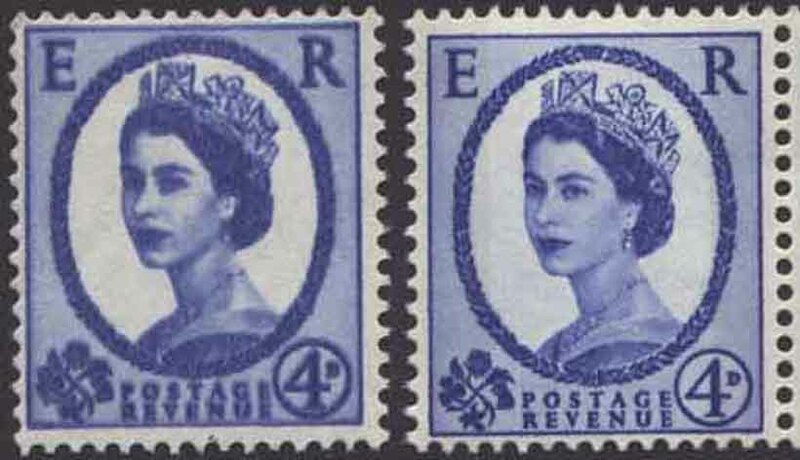 The 1958 4d Wilding definitive has been found with double impression. This is shown below with a normal for comparison. Both are the deep ultramarine not to be confused with SG576, the original paler printing. The overall appearance of the stamp is much deeper than normal and rather blurred. This is a result of a doubling of the printing. There is a second image of the design about 0.3mm above the main image. All the lettering and horizontal frame lines are doubled and the laurel wreath is almost solid. Stanley Gibbons list a similar variety on the shilling value of the same series at £160. We hope to offer this attractive error in a future mail bid sale unless sold by private treaty first. Please Contact us if interested.